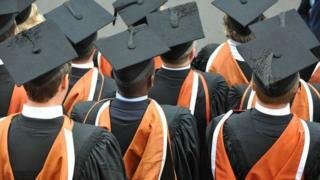 Head teachers in England are concerned that the promise of university tuition fee relief for teachers may be axed. The Conservative manifesto proposed that teachers would not repay tuition fees while they remained in teaching - to help tackle staffing shortages. Many other education policies have been ditched - and heads' leader Russell Hobby says he is concerned the new government has "gone quiet" on fees. He called for urgent clarification on whether the plan was being dropped. A statement from the Department for Education said: "We want the best teachers working in our schools and are investing in various initiatives to attract high quality graduates in an increasingly competitive jobs market. "We will provide more details on how we will take forward these proposals in due course." But the department would not elaborate on whether that meant the fee relief plan would or would not go ahead. The manifesto proposal would have provided an incentive for more graduates to enter teaching and to improve retention - with the promise of not having to make tuition fee repayments while they stayed in the profession. Teacher shortage due to "workload and pressures"
The policy promised "forgiveness on student loan repayments while they are teaching", raising the prospect that people who remained in teaching during their careers could save on fees that are set to rise to £9,250 per year. This had been welcomed by school leaders, who have complained about worsening problems of teacher shortages. But in the wake of the election result, many of the Conservatives' education plans are no longer going ahead - including the expansion of grammar schools. The Queen's Speech set out no plans for any education legislation. School leaders are concerned that the proposal for teachers and tuition fees could also disappear. "Recent data shows that we are struggling to recruit and retain teachers and this is leading to serious difficulties in schools," said Mr Hobby, leader of the National Association of Head Teachers. "We need to think creatively about ways to attract talented people into the profession and so it would be disappointing if ideas like this get put on the back burner." Mr Hobby said this was part of wider concerns about a lack of clarity over school funding plans. "Funding has a huge impact on recruitment and school leaders will be worried that the government has gone quiet on its proposals of tuition fee relief for people studying to be teachers. "The government must clarify this point urgently." Another head teachers' leader, Geoff Barton, pointed to rising levels of vacancies in schools, and said that staffing shortages reflected the lack of pay rises. "The problem is that we aren't attracting enough people into teaching in the first place, and then we are not retaining enough of them," said Mr Barton, leader of the ASCL head teachers' union. "The government has to lift the teaching pay cap and better incentivise teaching, and it has to work with the teaching profession to develop a career strategy which better develops and retains staff." Earlier this year, the cross-party Education Select Committee warned of "significant teacher shortages" and called for a more effective long-term plan to ensure an adequate supply of teachers.